The Bureau of Labor Statistics (BLS) projects employment growth of 11% for database administrators between 2016 and 2026. Meanwhile, computer occupations as a whole are expected to grow 13% during that same period. The increasing popularity of database administration done by a third party over the internet adds to this increase in employment for database administrators at cloud computing firms. Students entering database management can pursue administration careers or explore a variety of other opportunities in the field of computer and information technology. 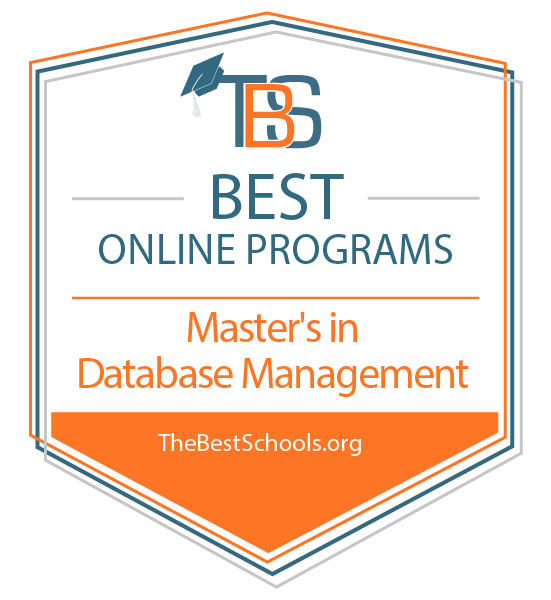 Online Master's in Database Management Degree Program Ranking Guidelines: We selected the degree programs based on the quality of program and range of courses provided, as well as school awards, rankings, and reputation. USC Online offers more than 100 degree options, including the master of science in computer science (data science). Totaling 32 units, the USC program trains students in computer science fundamentals, enabling them to retrieve, store, analyze, and visualize data. Graduates are equipped to pursue careers in diverse industries like healthcare, transportation, and energy. USC facilitates online learning through the Den@Viterbi platform, which blends asynchronous and synchronous classes. Distance learners view the same lectures as on-campus students. Those who join live classes can ask professors questions in real time. Full-time students can earn their degree in as few as 18 months, while part-time students obtain their master's in 2-3 years. Core topics include database systems, algorithms analysis, and artificial intelligence foundations. Students choose three advanced electives from data systems or data analysis topics. UNC provides an online master of business administration with a data analytics and decision making concentration. Through research-based seminars, students create, implement, and communicate data-driven business strategies. To earn their degree, candidates must complete 66 credits. Distance learners usually take two classes per quarter, completing the program in two years. Students take one core class in analytical tools. The remainder of the degree plan consists of electives, with options like digital marketing, information modeling, and information management. Distance learners may also take courses at UNC partner universities. Furthermore, the university offers MBA candidates worldwide immersion opportunities. During immersions, students collaborate with peers, teachers, and industry leaders in hands-on learning. UNC is regionally accredited by the Southern Association of Colleges and Schools Commission on Colleges (SACSCOC). Drawing from a multidisciplinary pedagogy, UC Berkeley's online master of information and data science trains students to design innovative services, applications, and business solutions. Students use analytical tools to work with complex data and solve real-world problems. Degree candidates can pursue their degree through full- or part-time enrollment. An accelerated path could earn students a master's in as few as 12 months. The 27-unit curriculum consists of core topics in statistics, machine learning, data engineering, and research design and application. A 3-4 day immersion on UC Berkeley's campus is also required. Students without adequate object oriented programming experience must complete a Python for data science class. Degree candidates finish their program with 3-4 advanced electives and a capstone course. UC Berkeley accepts applications on a rolling basis. UC Berkeley is regionally accredited by the Western Association of Schools and Colleges (WASC). The University of Illinois Online offers 90+ academic programs and enrolls more than 72,000 students worldwide. The catalog includes the fully online master of computer science in data science, a 32-credit program centering on cloud computing, machine learning, data mining, and data visualization. Students also develop skills in statistics and information science, empowering them to extract and apply meaningful information from vast, unstructured data. Illinois students pursue a non-thesis degree plan with advanced classes like practical statistical learning, Bayesian modeling, and data cleaning and curation. Though not required, students may round out the curriculum with a capstone project. The university facilitates asynchronous distance learning through the Coursera MOOC platform. All online students enjoy the same affordable tuition rate. They may further reduce costs by transferring up to 12 credits of previous graduate coursework. Degree candidates apply for spring or fall admission, with respective deadlines at October 15 and May 30. UCLA enrolls over 13,000 graduate students every year. Many students pursue distance education, including the online master of science in engineering with certificate of specialization in data science engineering. Through integrative training and research, UCLA students work with massive data systems and create technological solutions to scientific and business challenges. This 36-unit online master's in database management program includes four core classes in machine learning algorithms, big data analytics, and large-scale social and complex networks, among other topics. Students also take guided electives and a comprehensive exam. UCLA offers fall and spring admission. Applicants must hold a bachelor's in physics, engineering, or mathematics from a school accredited by the Accreditation Board for Engineering and Technology, Inc.
UCLA is regionally accredited by the WASC Senior College and University Commission (WSCUC). Villanova offers a fully online master of science in analytics that prepares students to leverage business intelligence in the expanding global marketplace. Degree candidates learn to identify, collect, and implement data. The Villanova program only offers part-time enrollment, which greatly benefits working professionals. Students take two course each semester, earning their master's in two years. The 36-credit program includes coursework in business intelligence, multivariate data analysis, enterprise data management, and analytical methods for text and web mining. The curriculum culminates in an analytics practicum. All distance learners enjoy the support of Villanova's Center for Business Analytics, which provides research and conference opportunities. Villanova is regionally accredited by the Middle States Commission on Higher Education (MSCHE). The online MS in analytics receives programmatic accreditation from the Association to Advance Collegiate Schools of Business (AACSB). A global leader in research and education, the UW-Madison College of Engineering offers 10 distance education programs, including the online master of engineering: engineering data analytics. The program emphasizes data collection, analysis, and presentation, enabling students to apply information to engineering processes with ease. UW-Madison offers fall and spring admission. Totaling 30 credits, the degree typically spans 2-3 years. Degree candidates take five core classes in topics like industrial data analytics, high-performance computing, and elements of software engineering. The remaining credits are advanced electives in seven concentration areas: management, manufacturing, engine systems, controls, powers, polymers, and professional development. Students do not need to complete a thesis or capstone and there are no on-campus visits required. Distance learners gain access to the university's academic libraries, which collectively hold 10% of the world's library resources. UW-Madison is regionally accredited by the Higher Learning Commission (HLC). Penn State stands as a preeminent research university and, through its World Campus, offers over 50 remote graduate programs. This academic catalog includes the online master of professional studies in data analytics, a 30-credit program that centers on big data and database design. Through a comprehensive curriculum, students solve business challenges involving large-scale structured and unstructured data. Degree candidates take three core classes in data mining, applied statistics, and predictive analytics.The rest of the degree plan contains prescribed and open electives, empowering students to personalize coursework for their career trajectory. Graduate training culminates in a capstone experience where students design and implement data systems using prescribed best practices and contemporary tools with the assistance of a faculty advisor. To apply to the Penn State online master's in database management program, candidates must hold a regionally accredited bachelor's degree with a minimum cumulative GPA of 3.0. Founded in 1854, Columbia is a private Ivy League school that enrolls over 32,000 students annually. Through its multidisciplinary Data Science Institute, Columbia provides an online master of science in data science, a 30-credit program full-time students can finish in 18 months. This hybrid program combines remote coursework through the ColumbiaX platform with evening classes on campus. Degree candidates fill 21 credits with core classes. Topics comprise probability theory, machine theory, and exploratory data analysis and visualization. Students also need to complete an ethics-focused capstone. With the sponsorship of a faculty member or local organization, students synthesize knowledge and skills to solve real-world challenges in government, industry, or the nonprofit sector. The remaining nine credits are open electives. Admission requirements include academic transcripts, three recommendation letters, a personal statement, resume/CV, and GRE scores. Columbia is regionally accredited by the Middle States Commission on Higher Education (MSCHE). John Hopkins operates highly renowned distance education programs, including the online master of science in data science. Balancing theory and practice, the John Hopkins program trains students to analyze, transform, and apply complex data sets using formal modeling and abstraction techniques. Distance learners can earn their master's entirely online through the Coursera platform or through a hybrid learning experience, benefiting from both asynchronous coursework and on-campus training at the Applied Physics Laboratory. The 30-credit degree plan consists of required topics like data visualization, computational optimization, and statistical models and regression. Beyond these core classes, students enjoy the flexibility of guided and open electives. In addition to a regionally accredited bachelor's degree and a minimum 3.0 GPA, John Hopkins requires completion of certain prerequisite courses. Candidates must demonstrate skills in discrete mathematics, multivariate calculus, data structures, and Java/C++. John Hopkins is regionally accredited by the Middle States Commission on Higher Education (MSCHE). Through its prestigious Joint Program in Survey Methodology, UMD offers the online master of professional studies in survey and data science. This 30-credit program trains students in advanced data generation, analysis, and quality assurance. Students also develop strong management and communication skills. Prospective students can apply for fall or spring admission. Degree candidates take 19 credits of required classes in five concentration areas: data output/access, data analysis, data curation/storage, data generating process, and research question. Students complete the remaining credits with electives, chosen with the close guidance of a faculty mentor. UMD distance learning synthesizes asynchronous and synchronous elements. While students access course materials at their leisure, they must meet once a week at a designated time for instructor-guided discussion. UMD is regionally accredited by the Middle States Commission on Higher Education (MSCHE). Through the Canvas learning management system, WPI facilitates 12 distance education programs for graduate students, including the online master of science in data science. By engaging in practical, purpose-driven coursework and projects, students learn to derive business intelligence from complex data. They also develop holistic business skills, such as team leadership and stakeholder interest negotiation. Online coursework largely operates asynchronously. Totaling 33 credits, the degree plan contains core classes like mathematical analytics, integrative data science, and data access and management. Beyond these requirements, students craft their own concentration with open electives. They also choose between a thesis or capstone project. Worcester does not require GRE scores for admission, and all distance learners benefit from affordable tuition and financial assistance. WPI is regionally accredited by the New England Association of Schools and Colleges (NEASC). Mizzou Online provides over 100 distance education programs, including the online master of data science and analytics. This 34-credit program prepares students for careers as business problem solvers who use statistical analysis and visualization to turn big data into smart data. Degree candidates engage in a hybrid learning experience that combines asynchronous online classes with two week-long intensive collaboration sessions at the Columbia campus. Degree candidates take 19 credits of core courses, covering topics such as big data security, information ethics, and database analytics. They also pursue advanced classes in concentration areas, including biotechnology and strategic communications/data journalism. Students round out their studies with a capstone project. The university does not require GRE scores for admission. Online students enjoy low tuition rates and financial support, like the Military Tuition Award. Mizzou Online is regionally accredited by the Higher Learning Commission (HLC). Northwestern enrolls over 13,000 graduate students every year. In addition to a comprehensive catalog of on-campus programs, Northwestern provides accessible remote learning opportunities. The online master of science in data science uses an interdisciplinary curriculum that trains students to retrieve, evaluate, and apply data for strategic business purposes. Students also develop practical skills in open-source systems like TensorFlow and Python. Degree candidates take 12 classes, including courses in generalized linear models and applied statistics. Specializations in data engineering, analytics management, and analytics and modeling, as well as a generalist track, are available. The degree plan ends with thesis research or a capstone project. The Northwestern program offers part-time enrollment, so students generally finish in 2-3 years. GRE scores are not required for admission. Northwestern is regionally accredited by the Higher Learning Commission (HLC). Through the Syracuse online master of science in applied data science program, students develop the technical and analytical skills to drive strategic business decisions. DataScience@Syracuse students come from diverse professional backgrounds, making coursework a collaborative and interdisciplinary experience. Distance learners take synchronous classes which emphasize interactivity with peers and instructors. Most students earn their master's in 18 months. The 36-credit curriculum centers on four key learning competencies: capture and organization; technical analysis; visualization and communication; and practical application. While the majority of the degree plan contains required classes, students do get 12-15 elective credits to pursue individual interests. As degree candidates complete classes, they document projects in a portfolio, submitted for faculty evaluation during the final term. Prospective students may apply for January, April, or July admission. Application materials include academic transcripts, two recommendation letters, a resume, a personal statement, and GRE scores. Syracuse is regionally accredited by the Middle States Commission on Higher Education (MSCHE). As a leader in distance education, OSU offers 19 accessible graduate degree pathways, including the online master of science in data analytics. Comprising 45 quarter credits, the OSU program equips students with the quantitative methods to gather, analyze, and implement large-scale data. Distance learners take asynchronous classes through Canvas, collaborating with peers to solve real-world problems. Core classes include time series, multivariate, and advanced data analytics. Degree candidates also take three computer science classes and four electives. Furthermore, they can apply said electives toward a health analytics concentration. The curriculum culminates with a capstone project. OSU offers graduate admission for fall, winter, and spring quarters. The university does not require GRE or GMAT scores for admission. Distance learners also benefit from low per-credit tuition and financial aid opportunities from Oregon State. OSU is regionally accredited by the Northwest Commission on Colleges and Universities (NWCCU). Georgia Tech offers 13 graduate programs, including the online master of science in analytics. Distance learners take fully online classes through Blackboard Learn, developing the mathematical and analytical skills to extract relevant information from data streams. Georgia Tech provides fall and spring admission for graduate students and offers one of the lowest online tuition rates for U.S. graduate students. Totaling 30 credits, the degree plan consists of required classes in data analytics computing, modeling, and business fundamentals. Beyond these core topics, students take classes in a specialization, choosing from analytical tools, business management, or big data. Degree candidates round out the curriculum with a capstone project, working with an external firm to develop real-world experience. Georgia Tech is regionally accredited by the Southern Association of Colleges and Schools Commission on Colleges (SACSCOC). The innovative SMU online master of science in data science uses a skill-based curriculum that combines self-paced coursework with live weekly classes and collaborative projects. The program centers on statistics and visualization, training students to mine, analyze, and apply data to make strategic business decisions. Students generally earn their master's in 24 months, but can reduce the timeline by four months with an accelerated path. SMU's master of science in data science curriculum totals 33.5 credits and includes courses in applied statistics, network security, and quantifying the world. Students also take electives chosen from specializations in machine learning or business analytics. Degree candidates must complete a capstone, comprised of independent research and a 3-4 day immersion experience. SMU offers thee start dates each year. To apply, candidates must submit GRE scores, possess adequate skills in quantitative mathematics, and have fluency in a programming language. SMU is regionally accredited by the Southern Association of Colleges and Schools Commission on Colleges (SACSCOC). Founded in 1829, RIT enrolls over 3,200 graduate students in accessible academic programs, like the online master of science in data science. This 30-credit program emphasizes experiential learning and career development. Students cultivate theoretical knowledge and practical skills through problem-based assignments. Admission criteria include a regionally accredited bachelor's degree and a minimum cumulative GPA of 3.0. Course topics include regression analysis, statistical data mining, and time series analysis and forecasting. Degree candidates also work with Python through classes dedicated to probability, random variables, machine learning, and MDL entropy. In their final year, students complete a capstone where they develop a data system or create their own research approach. Rochester students generally earn their master's in two years, but may take up to four. Rutgers offers an online master of business and science in analytics and data science that synthesizes management and financial skill development with topics in data mining and machine learning. Through a comprehensive 43-credit curriculum, students analyze and model large data sets to support organizational decision making. Degree candidates take the majority of their classes online through an asynchronous format. However, they do need to attend a weeklong campus meeting once per year. Students take 24 science and 19 business credits. Course options include cloud computing, market assessment, accounting principles, and data warehousing. Students also train in program languages and technologies, such as R, SAS, Python, SQL, tableau, and matlab. The degree plan ends with a science and technology management capstone where students work in project teams to create business plans and analyze technological innovations. Distance learners generally earn their master's in two years. Through its e-campus, UW-Eau Claire offers over 60 graduate programs, including the online master of science in data science. This 36-credit program draws from a multidisciplinary curriculum where students use data science methods to gather information from structured and unstructured data sets. The fixed degree plan includes courses in data science ethics, prescriptive analytics, advanced programming, and big data. As the culminating experience, students pursue a capstone project that requires them to develop research methods and present findings clearly to an audience unfamiliar with data science. UW-Eau Claire offers fall, spring, and summer admissions. To apply, students must hold a regionally accredited bachelor's degree, earned with at least a 2.75 cumulative GPA. Applicants also need to demonstrate, through undergraduate coursework or job experience, skills in elementary statistics, computer databases, and programming concepts. UW-Eau Claire is regionally accredited by the Higher Learning Commission (HLC). The BU online master of science in computer science with a concentration in data analytics prepares students for careers as information architects, engineers, and consultants. Through the 40-credit curriculum, students apply statistical analysis and probability theory to unstructured text and hidden data patterns. Distance learners take asynchronous classes powered by Blackboard Learn, earning their master's in 18-24 months. The degree plan evenly divides into core and concentration requirements. Core courses include topics like database design, business data communications, and Java information structures. Concentration courses include data mining and web analytics. Boston University does not require on-campus, internship, or capstone experiences. In addition to a regionally accredited bachelor's degree, candidates must display proficiency with computer information systems. The university provides affordable per-credit tuition for part-time students, while full-time students pay a flat rate each semester. BU is regionally accredited by the New England Association of Schools and Colleges (NEASC). UWL offers 11 distance education programs, including an online master of science in data science. Through a fully remote curriculum delivered by the Desire2Learn platform, students learn to identify and analyze rich data sources. They also develop management and communication skills necessary to lead teams through the entire data project cycle. Degree candidates take 36 credits. Topics include statistical methods, data warehousing, data communication, and strategic decision making. Students also complete a capstone project, where they work with real-world data to answer a complex research question. To apply, candidates need a minimum cumulative 2.85 GPA. The UWL program operates a unique home-campus model. Students apply to one of six partner institutions within the University of Wisconsin system, which then acts as their administrative and academic support center. Applicants must have completed elementary statistics, and introductions to programming and databases either with UWL or through an undergraduate degree. UWL is regionally accredited by the Higher Learning Commission (HLC). DU's University College offers career-driven graduate programs, including the online master of science in information and communications technology with a concentration in database design and administration. Students create and maintain databases, applying modeling and warehousing techniques to improve business performance. Distance learners can earn their master's in as few as 18 months. DU offers a fully online curriculum, with asynchronous courses powered by Canvas. Alternatively, students can pursue hybrid learning with evening classes on campus. The online master's in database management degree plan totals 48 credits. Students take classes in topics such as technical foundations, enterprise architecture, and web-enabled information systems. Students also pursue four electives chosen with the help of an academic advisor. Degree candidates finish their training with either a capstone project or seminar/thesis. Applicants do not need to submit GRE or GMAT scores. Through the UNT online master of science in advanced data analytics, students synthesize statistics, data visualization, and big data skills to bolster organizational and professional growth. Operating out of the New College at Frisco, an offsite instructional facility, students earn their master's through a interactive hybrid learning method. Learners benefit from training with expert faculty and industry partners, earning their degree in just 12 months. The 30-credit degree plan consists of five core classes, including discovery and learning with big data. Degree candidates take advanced coursework in their concentration, choosing from health analytics or a generalist track. All students must complete an interdisciplinary capstone. Prospective students may apply for fall, spring, or summer admission. UNT offers fellowships and scholarships of up to $34,000. Graduate students also benefit from research and teaching assistantships. UNT is regionally accredited by the Southern Association of Colleges and Schools Commission on Colleges (SACSCOC). OSU offers over 20 distance education options for graduate students, including the online master of science in business analytics. A 33-credit program, the MSBAN helps students develop business acumen and proficiency in multi-platform data analysis. In addition to comprehensive academic training, OSU provides in-house tutoring to help students pass Statistical Analysis Software certification exams. Degree candidates take 22 credits in core classes, including descriptive business analytics, programming, and advanced database management systems. The remaining credits go toward electives, which students can use to pursue a specialization in statistics, marketing analytics, healthcare analytics, human resources analytics, or optimization. Beyond classroom instruction, online students develop their skills through industry projects and internship opportunities. The OSU admission process requires GRE or GMAT scores unless a candidate possess five or more years of relevant work experience. OSU is regionally accredited by the Higher Learning Commission (HLC). The online MSBAN receives programmatic accreditation from the Association to Advance Collegiate Schools of Business (AACSB). UIS enrolls 2,500 graduate students in 20 programs each year, including distance education tracks like the online master of science in data analytics. This interdisciplinary program provides advanced mathematical and computer science training, enabling students to preprocess, interpret, and represent data sets. Program eligibility requirements include a minimum undergraduate GPA of 3.0 and completion of seven prerequisite courses. UIS offers generous financial aid and over 70% of students receive yearly awards. Distance learners enroll every fall, taking 36 credits in classes like big data analytics, statistical computation, and advanced database conceptions. Degree candidates also train in operations research methods, which leads into the data analytics capstone. This culminating experience tasks students with applying appropriate theories and tools in a real-world organizational setting. Located in Moon, Pennsylvania, RMU provides 17 graduate programs for distance learners, including the online master of science in data analytics. Totaling 30 credits, the RMU program emphasizes data management within an organizational setting. Students learn to transform data into actionable insight that helps businesses make better strategic decisions. RMU offers a free application, and online students benefit from institutional scholarships and awards. Degree candidates take 7-8 core classes in topics like computer network security, geographic information systems, and data integration for analytics. They complete the remaining hours in their chosen concentration, with options of enterprise systems, internship, or a generalist track. The internship specialization greatly benefits working professionals, who can integrate current careers into their graduate education. RMU is regionally accredited by the Middle States Commission on Higher Education (MSCHE). Saint Leo offers over 70 distance learning programs through the Blackboard learning platform. This wide catalog includes an online master of business administration with a concentration in data analytics. The Saint Leo MBA trains students to increase organizational efficiency, reduce costs, and make quick strategic decisions through data examination. Distance learners typically earn their master's in under two years. The 36-credit degree plan contains coursework in core business and data analytics topics, including managerial economics, global business management, web analytics, and applied statistics. Saint Leo's program does not require internship or capstone experiences. Saint Leo provides affordable tuition and financial assistance, like the MBA Online Academic Achievement Scholarship. To apply for this $6,000 award, students must meet all admission requirements and hold a cumulative undergraduate GPA of 3.25. Saint Leo is regionally accredited by the Southern Association of Colleges and Schools Commission on Colleges (SACSCOC). Based in Potsdam, New York, Clarkson offers a comprehensive online master of science in data analytics. The 33-credit program spans two years and empowers students to turn big data into smart data. Required coursework includes information visualization, optimization methods, and database modeling, design, and implementation. The degree plan also leaves room for personalization with four open electives. Students round out their graduate education with a capstone experience, where they work in interdisciplinary teams on a sponsored project. Clarkson requires candidates to submit GRE/GMAT scores, three letters of recommendation, response essays, and a resume. The school does not dictate a minimum GPA, and students may apply for standardized test exemption if they have excellent academic credentials. Distance learners can earn their master's entirely online or can pursue hybrid learning by taking classes on campus. Based on capstone project specifics, students may need to engage in on-site intensive fieldwork. Clarkson is regionally accredited by the Middle States Commission on Higher Education (MSCHE). Students pursuing their online master's in database management balance theory and fundamentals with industry-relevant projects and applications. Learners explore data analytics and engineering while maintaining ethical standards in data management. Upon graduating, students can create infographics and visualizations to explain data, identify patterns and trends in data, and use data to find new revenue sources to define business strategies. Students study a variety of important topics, including database administration, data warehousing design, and technical foundations. Some database management programs allow students to choose a concentration and tailor their degree to meet their interests. While every database management program differs, each provides students with a solid skill set and knowledge base to thrive in the field. Some programs require students to complete a thesis, final project, or other on-campus component prior to graduation. Students in an online master's in database management program explore topics that prepare them for successful careers. Learners study different aspects of database management, including administration, data warehousing design, database design, implementing databases, and web-enabled information systems. While course topics vary by program, students can examine key components in their area of interest. Database Administration: The database administration course introduces students to the roles, responsibilities, critical knowledge, and skills necessary for database administrators. Data Warehousing Design: Focusing on the implementation of data warehouses, the data warehousing design course teaches students fundamental concepts, including record of source, metadata, granularity, and partitioning. Students learn how data warehousing can support various roles in the field. Database Design and Implementation: Focusing on the relational database model and logical, conceptual, and physical phases of database development and design, the database design and implementation course allows students to discover emerging data warehouse technologies. Web Enabled Information Systems: Introducing the design of web-enabled information systems and reviewing programming principles, the web-enabled information systems course teaches students about object-oriented principles. Students learn about web applications, exploitation of technology, and data retention and integrity. Technical Foundations: Providing students with a substantive review of technology, the technical foundations course reviews networking technology, hardware, databases, applications, and information services. Students learn about data in transit, data at rest, and data being processed. Graduates of online master's in database management programs can find work in many lucrative careers. Most graduates pursue careers as database administrators or managers, finding employment in a variety of work environments. Database administrators use specialized software to organize and store data, including customer shipping records and financial information. These professionals backup and restore data to prevent loss. Database administrators work in computer systems design, insurance, data processing, and educational services. Tasked with proposing innovative ways to improve an organization's efficiency, management analysts advise managers on how to make their organization more profitable through increased revenues and reduced costs. These professionals collect and organize information about problems or procedures needing improvement and suggest helpful changes. Additionally, management analysts interview employees and conduct on-site observations to determine what methods, additional personnel, and equipment may benefit the company. Responsible for analyzing their organization's computer needs and suggesting potential upgrades for top executives to consider, computer and information systems managers also direct and plan the installation and maintenance of computer software and hardware. These managers ensure the security of their organization's electronic documents, data, and networks. The largest employers of computer and information systems managers remain manufacturing companies, information companies, finance and insurance agencies, and computer systems design organizations.